The letters “MfS’’ are stamped in black on the cover of the inch-thick file on the desk in front of me. MfS: Ministerium fur Staatssicherheit. Better known as the Stasi. The folder belongs to the Stasi Records Office, the government archive of the detritus of four decades of spying on its own citizens by the former German Democratic Republic. More fundamentally, however, the folder belongs to Wolfgang Templin, a 59-year-old writer who was once one of the Stasi’s most-wanted men. They gave him the code name Verrater, “Traitor”, and trailed him for 17 years before forcing him into exile less than two years before the Berlin Wall came down. The Records Office headquarters on Alexanderplatz, east Berlin, occupy a crumbling five-floor complex – a former GDR statistics department. Here, more than in any other Berlin building I know, the old East Germany lives on: worn linoleum floors, uncomfortable plastic furniture, old-fashioned GDR signage. The files themselves come from an age before computers and graphic designers. Fragile, yellowing pages bearing words punched by the deliberate weight of typewriter keys. Black-and-white pictures pasted as if in a photo album, heavy as you turn the page. Journalists often use the term “East Germany’s feared secret police’’ to describe the Stasi, but sitting with Templin as he goes over his file, those words seem too weak. As he looks back at how the agents infiltrated his life, he doesn’t know whether to laugh or cry. One Stasi report about his 38th birthday party in 1986 was written by a guest who, when the files were opened, was revealed to have been an Inoffizieller Mitarbeiter, or IM. He cites broken marriages, ruined careers and suicides. Most Germans today know how evil the Stasi were. The rest of the world has a pretty clear idea too, most recently because of The Lives of Others, a film about the moral dilemmas facing a Stasi officer that won an Oscar this year, and which has been shown in more than 100 countries. But it didn’t take a box-office hit to reveal the horror. Germany’s clear-eyed handling of its Nazi past has informed its approach to the GDR’s dark history. In 1998, a parliamentary inquiry on the communist regime produced a 32-volume encyclopedia of a report. In the same year the government set up a foundation devoted to Aufarbeitung, or “coming to terms with the past’’. But the jewel in the Aufarbeitung crown is undoubtedly the Stasi Records Office. The agency, set up in 1992, is mammoth: 2,000 staff, a €100m annual budget, 173km of files, 39 million file cards and 15,000 sacks of shredded documents, torn up by Stasi officers in their last days of power and waiting to be pieced back together. The archive has received 5.5 million applications for information, launched hundreds of education initiatives and drawn admiring glances, and visits, from officials in Poland, Hungary, South Africa, Iraq, Argentina and dozens of other countries grappling with their own histories. As Dorota Dakowska, a Polish politics professor, puts it, Germany is the “Aufarbeitung champion’’.And yet after 15 years as a vital symbol of Germany’s 1989 “peaceful revolution” – and as an invaluable tool for individuals seeking personal Aufarbeitung – the Records Office is at the centre of a new debate. How long after a horrific event is a mammoth truth-seeking operation necessary, some people ask? How long is it appropriate? When, if ever, is it time to draw a line under history and move on? Bernd Neumann, the culture minister in chancellor Angela Merkel’s government, recommended in July this year that the Records Office be shut down “in the medium term’’, with the files moved to the government’s central archive. Access would not be affected, he said. The Office’s education work would be done by the Aufarbeitung Foundation and other groups. The proposal has sparked a feisty debate. Leading Social Democrats said it was too early to do away with a key symbol of German unity – a view seen as sentimental by some of Merkel’s Christian Democrats. While the Berliner Zeitung said Neumann’s proposal was ill-informed, the mighty Frankfurter Allegemeine Zeitung found a “near consensus’’ that the files should eventually be placed in the central archive – but also suggested that power struggles over money were what really lay behind criticism of the Records Office. I had met Templin the evening before his trip to the archive, at a reading he gave from his latest book, about Ukraine. The event took place outside Berlin so we had arranged to travel back together. Over beers in the train’s restaurant car, he recalled life as the child of working-class parents, committed to socialism from an early age yet critical of the GDR regime. He joined the SED communist party in 1970, while studying philosophy at Berlin’s Humboldt University, but grew increasingly disillusioned over the party’s limits on political thought. As his dissident activities grew, so did the political pressure. He left the SED in 1983, was sacked from a leading philosophy institute soon after and had to take work as a cleaner and forestry worker. When he helped form a dissident peace and human rights group, the Stasi observation intensified, as shown in the files, which Templin first viewed 15 years ago. But he and his fellow dissidents had guessed as much at the time. “We often wondered which of our members were IMs,’’ he tells me. ’For Templin, whose life was so twisted and turned by the Stasi, Bernd Neumann’s proposed closing of the archive is an affront. Templin notes that immediately after the fall of the Berlin Wall, both West Germany and the transitional East German government were against opening the Stasi files, worried it would spark recriminations. Dissidents won the day, but only after protests, sit-ins, even hunger strikes. Closure of the Records Office now would destroy the special status of the files, which is in turn important in working through German history, in both east and west. “This process needs at least another 10 to 15 years. Then we can talk about changing things,’’ he says. Neumann’s proposals are not the only reason Germany has chosen to re-examine the way it handles its past. In August, Marianne Birthler, head of the Records Office, heralded as a breakthrough a document found in the archives describing in unusual detail the GDR’s shoot-to-kill policy towards escapees at the Berlin Wall. A few days later it was revealed that a similar document was hanging in an exhibition run by the Office. Birthler is also accused of failing to confront damage to her agency related to the fact that 50 of its employees had worked for the Stasi. They were recruited before she took office, partly for their knowledge of the files, but it emerged under Birthler that the Office had misled parliament about the number of its former Stasi staff. Such fumbles have raised questions over whether the files are in the right hands. Tobias Hollitzer, director of a volunteer-run Stasi museum in Leipzig, is one of Birthler’s critics. When we meet at the museum, he makes clear, cupping and twisting his hands as he speaks, that he is a passionate supporter of Aufarbeitung but a critic of how the Records Office is being run. Hollitzer was among the first staff members in the Records Office branch in Leipzig but he left earlier this year, having seen “the character of the organisation change fundamentally since the early years”. What started as an exciting, hands-on project with a mission to help Germany tackle its past has, he says, turned into a lumbering institution committed primarily to its own preservation.He argues that top management has lost sight of its original task of archiving of documents and helping victims of the Stasi, spends too many resources on education and research that could be done by other agencies and has become too vulnerable to political pressure. He cites the portion of recovered documents placed in the archive: it stands at 75 per cent, which Hollitzer sees as a poor result after 15 years. Moreover, people who muster the courage to see their files sometimes have to wait up to two years to get hold of them. Birthler should realise, he says, that “it is the open access to the Stasi files – and not the Records Office itself – that is the inheritance of Germany’s peaceful revolution”. 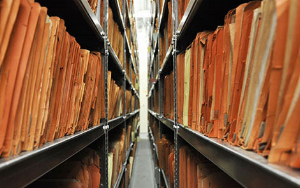 The decision to see your Stasi file is difficult enough without bureaucratic headaches. Ten years ago, the Oxford historian Timothy Garton Ash published a book called The File, recalling his experience with the Stasi. Garton Ash, or “Romeo”, as he was known to the Stasi, lived in East Berlin in 1980. Many, often intimate, details of his life at that time made it into his 325-page Stasi dossier, but the most “shocking and depressing” revelation, he tells me, was discovering that a good friend at the time, an elderly German-Jewish woman, had reported on him. And yet this example shows the complex moral universe a Stasi victim enters when opening the files. The woman had suffered greatly, her husband was held for more than a decade in Soviet labour camps, and she had worked for the Stasi, Garton Ash later discovered, because it was the only way in which she would be permitted contact with her son who had fled to West Germany. “I feel in the end nothing but sympathy and sorrow for this woman who has been tested in a way I’ve never been tested,” he tells me. But unlike the critics, Garton Ash believes Germany has handled it with care. “It has been exemplary. I’m tempted to say that no one has ever done it better.” Germany, he argues, has been able to become a normal country because of its exceptional handling of its abnormal past. “I don’t share this criticism [of the Records Office],” Garton Ash tells me. “I think people are losing a sense of proportion and of international perspective.” He argues the Office’s structure may not be perfect – it might, for example, be better for all historians to have full access to the files and not just Office staff as at present – but that is a “secondary issue”. When asked whether and when the files should become just another part of a central German archive, he admits “finding closure is also an important quality. The objective here is to put the past behind you, to make the past really the past”. Marianne Birthler may agree, but – perhaps unsurprisingly – she thinks it is far too early to shut the Records Office. “Germany needs more Aufarbeitung and not less”. The Office’s “integrated approach” of combining archival work with education and research should continue until at least 2019, 30 years after the Wall fell, she argues. Placing the files in the government archive would make access for researchers and others more difficult, she says. A former dissident herself, Birthler nurtures the air of being an outsider in establishment Berlin. “A large institution like ours needs criticism by the public,” she says, but points out there was no model to follow in the archive’s early years. So is the Office busier trying to organise its own survival than serving Stasi victims? “A public institution like ours does not have a guarantee to exist forever,” she says, admitting that the recent controversies have not helped. Her mix-up over the shoot-to-kill document was “very embarrassing”. But she thinks Hollitzer and others are being naive in assuming that smaller Aufarbeitung initiatives for education or research can take the Office’s place. “It’s a big mistake to think that when our authority is weakened, others will be strengthened”. The Aufarbeitung community needs to rally behind its “flagship”, the Records Office, if the “rest of the fleet” is not to suffer. He says he was “rather useless” as an IM, but was still shaken by the experience. Has anyone found his name in their Record Office file? They may have, but it shouldn’t have come as a shock. Back in 1975, when he decided to get out of the spy business, he cut his Stasi ties by publicly denouncing the agency. While his political friends were angry with him at first, his decision to speak out about his experience convinced them he was on the right side. Denouncing the Stasi was rare in the days of the GDR, but it earned a young Templin redemption. Opening the files of the Stasi Record Office did the same for a young, reunified nation. Is the older, wiser Germany ready to look away at last – to look forward, not back?